Babette Bliss, the decidedly modern heroine of this comical novel, suffers from an unsettling problem: ambivalence. She has taken leave from her job with an avant-garde New York theater to face her dilemmas concerning her marriage, career, and soul. Should she forgive her philandering husband, George Harrison, an Iowa-raised corporate lawyer with an uncanny resemblance to Babette's favorite Beatle? Is it time, in fact, for her and George to have a baby? Or should she have an affair? She is thrown into even deeper confusion when Shara-Rose, her leather-clad therapist, decides to give up her practice and become a rock star. No matter where Babette looks, abandonment is everywhere. So can she really desert her theater, at a time when the company is faced with eviction? To sort things out, she decides to live by herself again—only to team up with an unexpected roommate. 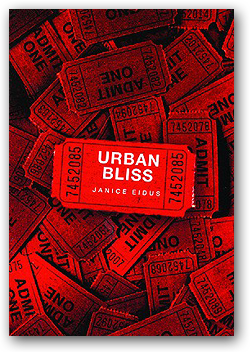 Filled with subtle irony and insight, Urban Bliss is a humorous and touching novel that takes up old-age problems and sheds a contemporary light on them. "... A ruefully funny, wickedly observant take on urban angst." "Eidus has a spirited voice and a sly affection for her characters. Eidus's exploration of the place of fidelity in modern culture is provocative and wise." "Urban Bliss is a very original and funny novel. Eidus takes chances and straddles the abyss between lost innocence and the always changing future."